Can we get multiple lookup values for an item in a single cell (separated by comma or space)? I have been asked this question multiple times by many of my colleagues. And after a lot of head-banging, I realized that it is extremely difficult (if not impossible) to do this using excel functions. So I did a bit of VBA coding to come up with a custom function (also called a User Defined Function) in Excel. In this tutorial, I will show you how to get multiple lookup values in a single cell (with and without repetition). To get multiple lookup values in a single cell, we need to create a function in VBA (similar to the VLOOKUP function) that checks each cell in a column and if the lookup value is found, adds it to the result. Result = Result & " " & LookupRange.Cells(i, ColumnNumber) & ","
Open a workbook and click Alt + F11 (this opens the VBA Editor window). 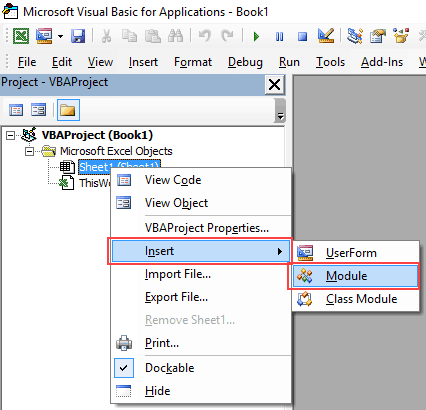 In this VBA Editor window, on the left, there is a project explorer (where all the workbooks and worksheets are listed). Right-click on any object in the workbook where you want this code to work, and go to Insert –> Module. Now you are all set. Go to any cell in the workbook and type =SingleCellExtract and plug in the required input arguments (i.e., LookupValue, LookupRange, ColumnNumber). This function works similar to the VLOOKUP function. 1. Lookupvalue – A string that we need to look-up in a range of cells. 2. LookupRange – An array of cells from where we need to fetch the data ($B3:$C18 in this case). 3. ColumnNumber – It is the column number of the table/array from which matching value is to be returned (2 in this case). When you use this formula, it checks each cell in the leftmost column in the lookuprange and when it finds a match, it adds to the result in the cell in which you have used the formula. Remember: Save the workbook as a macro-enabled workbook (.xlsm or .xls) to reuse this formula again. Also, this function would be available only in this workbook and not in all workbooks. There is a possibility that you may have repetitions in the data. If you use the code used above, it will give you repetitions in the result as well. If you want to get the result where there are no repetitions, you need to modify the code a bit. Here is the VBA code that will give you multiple lookup values in a single cell without any repetitions. Once you have placed this code in the VB Editor (as shown above in the tutorial), you will be able to use the MultipleLookupNoRept function. Here is a snapshot of the result you will get with this MultipleLookupNoRept function. How to Record a Macro in Excel – A Step by Step Guide. hi can someone help me for the singlecellextract is it possible to use this udf if my lookupvalue is a comma separated value? I am very new to VBA, i have a scenario as below. 3. Store the query result into a single cell as List value. Can anyone please help me getting this work. Thanks!!! Your VBA code is fantastic and its serving my purpose to a great extent. But i am facing another problem which needs to solved. Please help me with the coding. Problem is in the desired ColumnNumberi.e result column some cells are blank. So your code is accepting the blank value(with a delimiter) along with other values. Would anyone help me with macro for a shift schedule of operators working in 2 shifts. It should choose operators from database and populate in the shift tables according to their expertise in relevant machine? How do i get this to work as a Hlookup? Hi there. I want to do something similar to this. I have a table with people named in row 2, and the date all the way down column 2. I want to be able to generate a comma separated list of those who are on annual leave “AL” for each corresponding day. So it’s similar to your code, but looks along a row, instead of down a column. You could do this with a bunch of if statements in the final column. =If (B2=”AL”,$B$1,””) & If (C2=”AL”,” “&$C$1,””) etc. Won’t be comma separated though. Written on phone so excuse mistakes. I need to use this code on a different worksheet – from the one the list is created on. What do I need to edit to make that happen? Not much of a coder at all…. Same issue for me. I need this to work on another worksheet. Were you able to figure it out? I found your Multiple lookup values in one ell in your forum and it helped me a lot. Now i need to improve that and I need your help regarding this. We have used a code for only one column or a cell as a lookup reference. Now I need to include one more to this. 2 columns as s lookup reference to get the same results. My code as per your example code is below. Could you please help me on this code to lookup 2 columns as a reference.? Hello, I have found your code and it helped. I have a query that, I need to lookup one more column with the same process. How can i do that? Please help me on this. It seems it is the thing i am looking for, but it doesn’t work! I get a #Name error. I have put it in the VB editor and saved it as .xslm. First used the function across sheets and doubted this was the problem. Then tried it i a single sheet with an example wit still got the #Name error. Any idea what i could be doing wrong? Saved it the wrong way or something? This is fantastic! 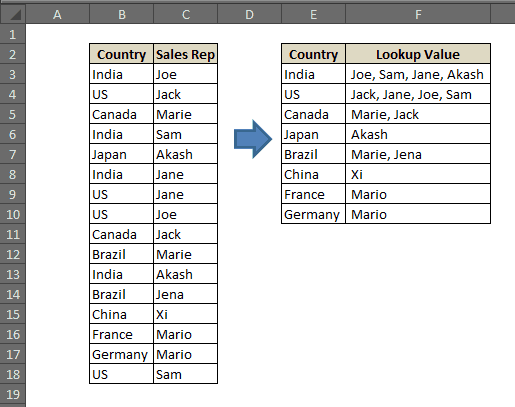 Is there a simple way to extend this to search through multiple columns, for example, if column D was another list of names (sales rep 2)? Also, is there a way to exclude blank cells?,If there happened to be a missing name, for example? Thank you for this. I had found something similar a while back called vlookupall that gives similar results but was a little harder to follow the internal logic. 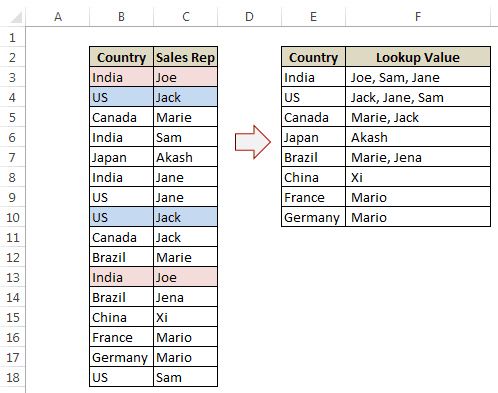 Hi, I appreciate your post showing how to do this using VBA, however I am wondering if there is a way to do this using only excel formulas? I have included it into my macro enabled spreadsheet and everytime it executes there is a compile error, like the one mentioned by Laura below. I have tried altering the brackets but no improvement. It looks like it cannot find the added function but I am just guessing. Any suggestions? It seems there is a funny character in there after copy / paste. As I just deleted it and typed it by hand and then it was fine. Really pleased as does exactly what I need. hi! thanks for this vba – how do i correct it so the vlookup value is not case sensitive? currently if I’m looking up “Apple” for example, I need to type “Apple”. If I use a lowercase “a”, it doesn’t lookup the value. Thank you! THANK YOU SO MUCH!!! it works!! Hey.. Sorry for the misisng file.. I have uploaded it! I wonder if anyone will still respond to this thread…. 3 is the 3rd column where i want the formula to look to pull out the results (result is text). Actually, I have the same problem, even copying your cells to my workbook. How did you resolved it? Not sure why VBA prefers it that way now, but it appears to work. This worked perfectly! Thank you for the tip! It wasn’t an extra closing parens. The “minus” char, here, is the wrong character. If you copy and paste from this blog, it’s actually the en-dash character. Simply replace it with the minus char. I have a question! Student names with ID’s and Class groups. How to take the list and use a combo box – select the class and the names appear on another sheet with their ID’s and class name. It does what you are looking for, and uses a data validation drop down instead of a combo box. But it can be easily replicated for a combo box as well. Hope this helps! Great Job Bro…But how can we get the results without duplicates? Hi Saji, Glad you liked it. Can u explain me this VB code?